Rollin’, rollin’, rollin’, man my *ss is swollen..
My favorite Billy Crystal lyric has been on my mind recently and if you have an indoor trainer you’ll understand why. But it’s not all bad, not at all. I never thought I’d say it (like I never thought I’d shave my legs, I suppose), but riding on a bike that goes nowhere can be good, and bad. 1. If you have a training program which asks you to hit and sustain a specific heart rate, power output or speed, an indoor trainer can’t be beat. 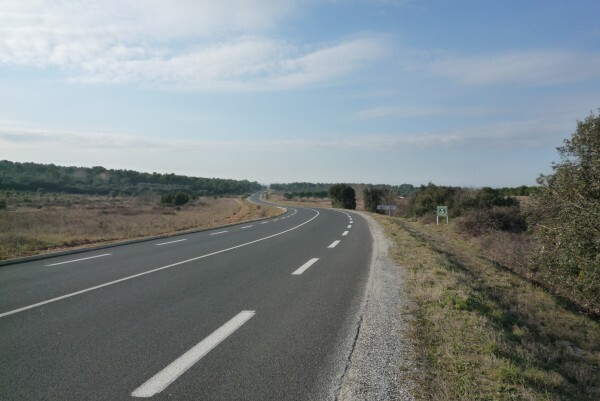 No matter how flat a stretch of road is, there’s usually wind, stoplights (or roundabouts if you come from a civilized country) and other obstacles that will prevent you from keeping a steady pace and staying in your zone. Here’s a recent workout I did on the trainer: HR Intervals 10.01.2012 14:15. And here’s one on the road, trying to something similar. No contest in terms of consistency: pyramid 04.01.2012 14:21. 2. The view is still not too bad, depending on how many cycling videos you have stockpiled at home. Here’s what I see from the saddle. No, I’m not staring at the ostrich painting (although it’s quite nice); look closer. That is Cadel Evans trying to chase Andy Schleck down on the Galibier in last year’s Tour. When I’m not staring at my top tube in agony I can watch and learn more about my new sport. 3. I probably can’t get run over while cycling in the apartment. 1. Refer to the lyrics above. Since you can’t freewheel on a trainer, you tend to feel the need to keep pedaling. Add to this the unfortunate fact that my current training program calls for a cadence of 90 to over 100 rpm and it becomes hazardous to try and ‘dance’ on the pedals at that speed of rotation. The result is a lot longer sitting on the saddle and the associated pain/numbness that comes with it (for me, at least). 2. Running out of clean towels. You don’t realize how much you are probably sweating on your bike outside until you go indoors and spin. I’m glad I’m not in a gym full of beautiful women (did I just say that?) because it’d be embarrassing. I need to hit Ikea for some more things to mop up with. 3. Time warps. Yes, sadly, even with the excitement that comes with watching other people in tight shorts suffer, the time really goes by pretty slowly, I have to report. I went out today for my Sunday long ride and the 100 minutes flew by compared to the marathon 110 minutes I struggled through last night on the trainer. 1. Riding on an indoor trainer is hard, there’s no question about it. I’m getting a much more concentrated workout that I have been on the road. Of course there is no substitute for the many challenges of real roads, but just in terms of fitness it seems to be more beneficial. I’m a slacker at heart, so I haven’t figured out if this is good or bad. I know I’m missing a lot, so if any of you have anything to add to this new, stationary world, comment away! 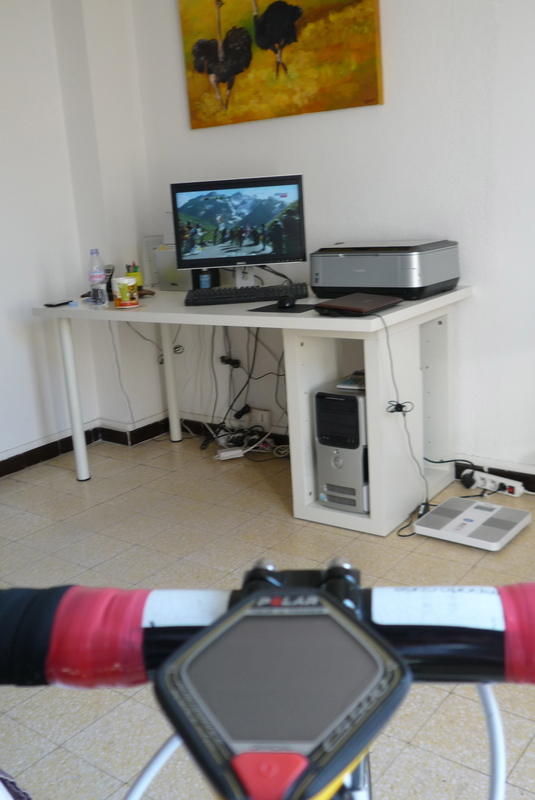 This entry was posted in Cycling and tagged training on an indoor trainer. Bookmark the permalink. Raaaaaw hiiiiiide! I love that film…. OK, that’s another good version, I admit. I feel your pain …. (I don’t really)….but I do admire your fortitude. I wouldn’t do it if I had a full-time job. The secret is afternoons off. I have thought about a trainer, but I’m not there, yet,.. if ever… But it sounds like you are getting the most out of yours. Two other points, 1) I went through a roundabout yesterday. I guess that means the Ozarks are getting civilized! 2) Those clouds in the pictures aren’t bad. They resemble the ones I saw yesterday here at home. I’m glad to hear that the Ozarks have civilized intersections and weather. It makes me want to go a ride there even more! Way to get outside a bit and struggle through the stormy weather! The D999 looks awesome to ride. Are the dashed lines indicating a shoulder? SWEAT: I never knew the human body had that much water in it, until I started training indoors. LOVE/HATE: I learned that I love the results from the structured training, but by the time spring rolls around I hate this machine so much I’m ready to throw it out the window. VIDEOS: After watching repeats of the Tour and Giro; you will know the cyclists names better than Phill Ligget and Paul Sherwin. SLACKING OFF: I learned there’s NO slacking off. Unfortunately you can’t coast downhill on an indoor trainer. I’ll have to trust you on the ‘love’ part. The ‘hate’ I can see coming soon. Luckily spring hits in February here sometimes, so there may be no smashed windows in my future…maybe. Thanks for the tip and encouragement, Laurie. After 6 weeks on the trainer I need both. I’m eyeing one of those saddles you mentioned, too. My cycling buddy just bought one and I’m waiting for his updated review.